Ace Hotel London Shoreditch is a retrofit of a ’70s business hotel by Universal Design Studio. The interior responds to co-founder Alex Calderwood’s mandate that it be “of London and for London.” The reception desk doubles as a gift shop that focuses on the district’s musical history. The communal oak table in the lobby is by London’s Benchmark. Left: The entrance to Hoi Polloi restaurant is through a floral shop run by Hattie Fox, who supplies the hotel with fresh arrangements; Right: Rows of lights define the foyer ceiling. UDS added the feature as a tribute to the area’s theatrical roots. UDS stripped the original building to its raw state, and inserted graphic flourishes to give the interior an industrial patina. The hotel’s affordable rates match the second-hand decor. A typical room mixes vintage finds with furniture pieces by local designers. The wall-to-wall sofa by UDS might inspire guests to invite people up to their rooms. Quilt by APC. Like most of London, Shoreditch is steeped in history; Shakespeare, for instance, is said to have staged Romeo and Juliet at the Curtain theatre there, before pulling up stakes and moving to the Globe. The East End district is now known as the place where Damien Hirst and Tracey Emin exploded onto the world art scene during the 1990s, and for endless graffiti by the likes of Banksy and Kid Acne splashed across every square inch of Brick Lane. At 100 Shoreditch High Street, just a few minutes’ walk from the underground and David Adjaye’s Dirty House, the Ace Hotel occupies a ’70s building that used to be an unremarkable business hotel. Shoreditch’s own Universal Design Studio, the architecture and interior design arm of Edward Barber and Jay Osgerby’s firm, re-clad the lower portion of the seven-storey structure with a handsome black engineering brick typical of the district. However, the most distinctive moves are found inside, where earth tones, natural timber, oversized stencilled graphics, and a material palette of cork, brass and copper define the reception area and the 258 guest rooms. 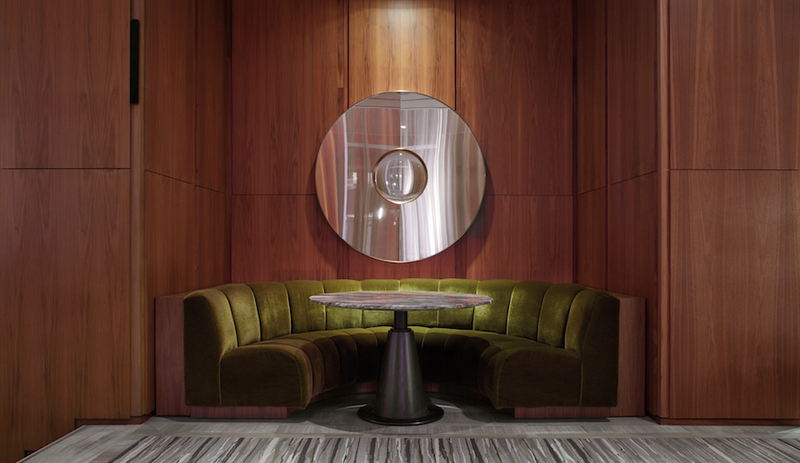 Rather than an overtly thematic interior, UDS crafted a utilitarian backdrop for locally designed objects, from an artfully messy row of potted plants by florist Hattie Fox lined up in the hotel’s foyer, to a massive oak table by Benchmark that fills a significant portion of the lobby. In another space, Tokyobikes stand ready for visitors to rent out, and in the bar area artist Max Lamb has put his stamp on the cladding, stools and cocktail tables. The adjoining restaurant, Hoi Polloi, a wood-panelled modernist brassiere, is already a hub for hipsters tapping away on their laptops while breakfasting on pickled onion rings. Residents feel right at home sharing space with out-of-towners, as is typical of an Ace Hotel (the U.S. chain now has seven locations). 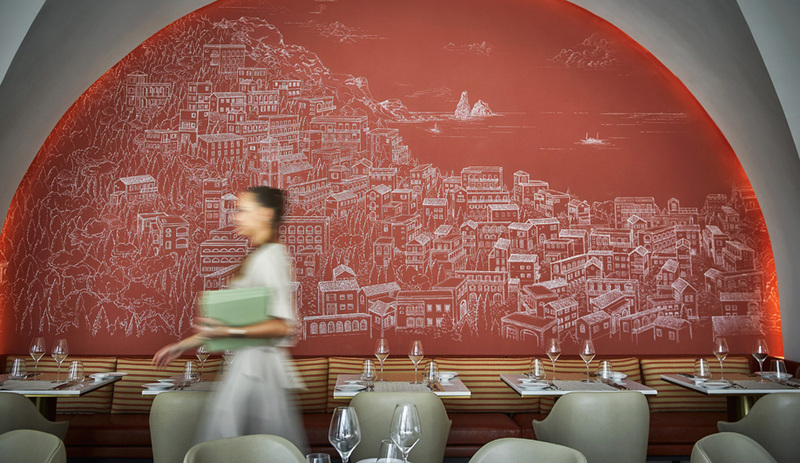 exhibitions, with a trendy restaurant serving up local fare. The concept is now so familiar that it has become the norm. Calderwood described Ace Hotel London Shoreditch as “of London and for London.” During a tour of the suites last fall, the mop-topped hotelier pointed out the original light switches and electrical sockets: “It’s nerdy, but I like this kind of hardware. It says ‘London’ to me.” (Tragically, Calderwood died at age 47, two months after the hotel opened in September). UDS’s bespoke approach – and the fact that its office is located just a few blocks away – appealed to Calderwood, who wanted each room to have the feel of a friend’s apartment. In response, UDS principal Jason Holley decked out each suite with a unique combination of vintage furniture finds and the firm’s own custom pieces, including low-lying oak bed frames, and five-seater sofas wrapped in a reverse-denim upholstery. Round tables more suited to a kitchen or dining room stand in for the usual hotel desk, and the walls and tabletops provide a canvas for an eclectic assortment of accessories, including Revo radios, vintage LPs and, in some rooms, C. F. Martin & Company guitars. You could easily get comfortable in these rooms and forget that you don’t actually live here. Culture drips from every pore of Shoreditch. Simply wandering Brick Lane can fill an afternoon of boutique shopping and Banksy graffiti spotting. Whitechapel Gallery (77–82 Whitechapel High Street), one of London’s finest art venues, is housed in an Arts and Crafts building designed by Charles Harrison Townsend. In September, product and interior designer Lee Broom opened Electra House (95 Rivington Street), a retail shop that sells his line of furniture and lighting, which mixes new shapes with retro-glam detailing. For novel, affordable British clothing and home accessories, nothing beats Goodhood (41 Coronet Street). Shoe designer Tracey Neuls opened her second shop (73 Red­church Street), where her bespoke leather loafers, heels and sporty bike shoes are on show, hanging from the ceiling. Nobrow Books (62 Great Eastern Street) is the place to go for graphic comics, illustrated titles for both adults and children, and even handmade books. According to UDS principal Jason Holley, who has worked in the area for over a decade, these are the top three restaurants: Story Deli (123 Bethnal Green Road), for wafer-thin pizzas and fresh toppings; and Brawn (49 Columbia Road), for local fare served in an unfussy environment that buzzes with activity; for authentic Italian food, don’t miss Bottega Prelibato (45 Rivington Street). If you’re not after a full meal, Leila’s Shop (15–17 Calvert Avenue) offers a rustic community café environment with such delicacies as crispy pork belly salad, as well as fresh produce, pickles and preserves.